Maas reiterated the EU’s rejection of a potential renegotiation of the withdrawal agreement, adding that the UK’s only option to avoid a “hard Brexit” was to simply accept the agreement that is on the table. “The agreement we negotiated with Britain is already a compromise — especially regarding the arrangements for Northern Ireland,” he said. Some in the EU have held out hope that the UK would not exit from the EU, but now more see the exit (called Brexit) likely. I have been warning for years that Northern Ireland would be a major issue with Brexit, and it clearly is. Even if there is a ‘hard’ (no deal with the EU) or ‘soft’ (May’s new proposal) Brexit, or even if there is no Brexit, I expect that the Republic of Ireland (or at least an Irish leader) will have control over Northern Ireland and probably other lands as well with the next decade or so. Nick Thomas, a 25-year-old hazardous waste operator from Cornwall, is insistent that Brexit will be fine. Probably. “If ‘no deal’ goes badly, there’ll be rioting on the streets and looting, national uproar. If people can’t eat, they’ll rise up and fight. But I can’t see it happening — that’s a very worst case scenario,” he said. He is not alone. A Facebook group, 48% Preppers, has almost 8,000 members, while other similar groups also have memberships in the thousands. As the withdrawal agreement flounders in the UK parliament, concerns about Britain leaving with no deal on March 29 are growing. A sudden disruption to long established customs agreements could mean gridlock at ports, lorries stuck on highways or ferries with goods spoiling, and shortages of food and medicines in Britain’s supermarkets and pharmacies. With the deadline to leave the European Union rapidly approaching, the prospect of crashing out without a deal has some Britons taking an approach akin to preparing for a natural disaster. From the outside, it looks like any other white cardboard box. It’s inside the box that things start to get interesting: there’s fire starter gel, a water filter, and a whole month’s worth of freeze dried meals — in flavors like chicken tikka and mac & cheese. The idea of having several days or even several weeks of food and other supplies is not unique for those worried about Brexit. 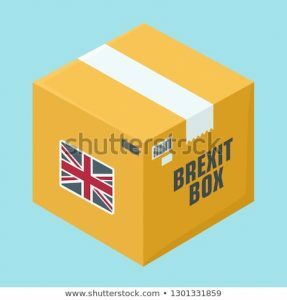 There may or may not be significant issues that will arise in the short-term regarding supplies if there is a ‘hard Brexit’ (as mentioned earlier in this post there WILL BE significant long-term consequences for the UK, including Northern Ireland). Living in California, we are often encouraged by various governmental agencies to have at least three days of food and water in case of emergencies like earthquakes. So, irrespective of Brexit matters, having supplies (and they do not need to be ‘Brexit boxes’) makes sense. That being said, Brexit will have many consequences for the UK and will ultimately affect the world in many ways that its backers and opponents have not considered. British – America in Prophecy & the Lost Tribes of Israel Are the Americans, Canadians, English, Scottish, Welsh, Australians, Anglo-Saxon (non-Dutch) Southern Africans, and New Zealanders descendants of Joseph? Where are the lost ten-tribes of Israel? Who are the lost tribes of Israel? What will happen to Jerusalem and the Jews in Israel? Will God punish the U.S.A., Canada, United Kingdom, and other Anglo-Saxon nations? Why might God allow them to be punished first? Here is a link to the Spanish version of this article: Anglo-América & las Tribus Perdidas de Israel. Information is also in the YouTube sermons titled Where are the Ten Lost Tribes? Why does it matter? and British are the Covenant People. A short YouTube of prophetic interest may be: Are Chinese threats against Australia for real? This entry was posted on Sunday, February 3rd, 2019 at 8:48 am	and is filed under Prophecy.